I have an unspoken tradition with my children, and that is to buy them chocolate each time that I travel. The particular brand that they like, at least from my experience so far, is only found at Jomo Kenyatta International Airport. And so this trip is no exception. I quickly make my way to the shop before going to board my flight to Kigali. I exchange quick pleasantries with the vendor, who dutifully packs my chocolates in a clear plastic paper bag and off I go. This is my maiden trip to Kigali. What I can’t get over is that I shall arrive at the same time that I depart. Kenya is an hour ahead of Kigali and the flight is only an hour. I am going to a business meeting, meaning that I have more or less a whole day to kill as it were. The journey is quick and uneventful. I can’t help but wonder how I am going to fill my time until my return flight in the evening. The thing about visiting African cities is that one never knows what to expect. I am constantly amazed by the vast difference and simultaneously vast sameness that each city seems to have. And so in the course of my travels, I have come to keep an open mind. The first impression that I have of Kigali when I am finally out of the airport is order. Brand experts say that the first impression of a country is at the airport. It is the window to the rest of the country, and that one can tell a lot about the affairs of a country by the way the airport looks. The immigration queues are orderly. The officers are dressed smartly in navy suits. There are banners strategically placed at various places from the Rwanda Development Board, informing us that one can open a business in Rwanda in a record 24 hours, possibly the shortest turnaround time in the world. At the luggage carousel, I am met by two airport officials who tell me that I mustn’t enter the country with any plastic bag. Of course, I remind myself inwardly. Rwanda has a total ban on plastics. I know that but I suppose that plastic bags are so common, it’s not information that I consciously internalised. They instruct me to go to a nearby makeshift kiosk to buy a bag and so I reluctantly part with $3 to buy the jute bag. My client has arranged for a taxi to pick me up from the airport. He is tall, at least 6’ 5” by my reckoning. He is dressed in a flamingo pink suit and patent leather sharp shooter shoes. He has multiple chains around his neck and rings on each of his fingers. He lifts his dark sunglasses to greet me. This man has swag. And he is a far cry from our typical jeans-and-leather-jacket clad taxi drivers here in Nairobi. I smile inwardly. He is my ride for the day. I am in for adventure. Without sounding presumptious, the client meeting goes as well as I thought it would. And at one in the afternoon, I am free. My taxi guy offers to take me round Kigali. We start with the old part of Kigali. The part of town that he tells me was the capital before the genocide of 1994. The buildings remind me of downtown Nairobi. What I can’t get over is the cleanliness of the streets. Also surprising, in my opinion, is the serenity. People seem to go about their business placidly, unlike other African cities that I have visited where there is constant background noise that one learns to tune out. The driver explains to me that during the genocide, those very streets were strewn with bodies and that there were rivers of blood from innocent victims. I was only 17 years old at the time of the genocide and had no full appreciation of the magnitude of this atrocity. The new part of the city is spectacular. The roads are well built and the streets well lit. Perhaps what stands out the most is the stark contrast between driver discipline in Kigali and in Nairobi. Our next stop is the Genocide Museum. Understandably, no photography is allowed. The taxi driver tells me that it is harrowing. 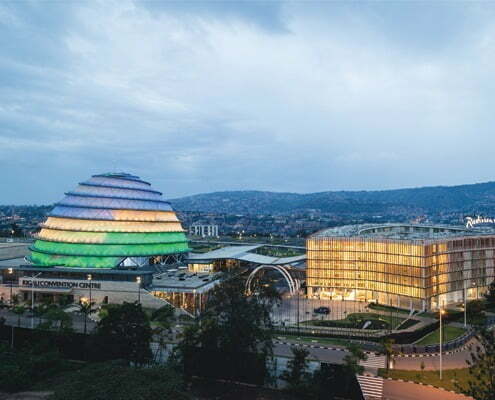 He is quick to add, however, that the other museums around Rwanda are more graphic than this one. However, no amount of mental preparation is sufficient for what lies ahead. A sombre mood engulfs the atmosphere. It is home to more than 250,000 victims of the genocide. In all, there were about 1,000,000 people who lost their lives. One can choose to have a guided tour but I prefer to go it alone so that I can see it through my own eyes. There are photos of the victims who lost their lives. The photos are haunting. The victims stare back at me with a vacant look in their eyes. I try to imagine what happened to each one of them that morning when they woke up. How did they wake up that morning? Had the war broken out? Were they planning their escape from Rwanda? Did they know their killers? It is said that the killers were largely known to the victims; they were neighbours, colleagues at work, and even friends. I notice a man in a corner weeping silently. He has no left arm. I wonder if he too was a victim, who only just managed to escape. Tears roll down his cheeks. He cries with a quiet dignity. He looks like one who is intimately familiar with sorrow. I wonder if looking at these pictures brings him any sort of closure. I hope that it does. I quietly walk to another part of the museum. This one has the clothes worn by the victims. They hang as on a clothesline. I am at a loss of the depths of hatred. Can humanity sink to such lows? One million lives. One million brothers, sisters, mothers, fathers, aunties, uncles, cousins, husbands, wives, lovers and friends. Gone. Sniffed out. Dead. Ended prematurely. I take a moment to compose myself. Nothing could have prepared me for this. I drift with difficulty to the next section of the museum. I am starting to wonder about the wisdom of this visit. Then again, I want to understand the past of these people. I am in their country. I need to see for myself their untold pain for me to understand how they have reconstructed this pain to build such a beautiful nation. I need to understand how they could have reconciled themselves with the past. I need to understand how they chose to put such a raw past behind them to forge forward to bring a new hope and a new future. I need to know. The next section of the museum has the crude murder weapons used on the victims. I think of our National Museum in Nairobi. The remains of Zinjathropus and his crude weapons for hunting and for gathering. The irony is palpable. Here I am staring at the crude murder weapons of innocent lives. I think of all the implements that we have in our homes; machetes, hoes, rakes, that are used for an honest day’s work. Yet these same weapons, in the blink of an eye could be turned to real weapons of destruction. And then I find myself in the seat of horror. The heart of the genocide. I am not looking at the photos of the victims, nor am I looking at the names of those who lost their lives. I am looking at the skulls. I am looking at the bones of the remains of the dead. I fall apart. Completely. The man that I had seen crying earlier is also in the room with me. He too cannot take any more. He weeps in primal grief. The skulls sit behind a glass display and the bones from the legs and arms are heaped atop each other in what looks like a glass casing. And so we stand there united in grief, trying, as much as we humanly can, to take it all in. I don’t know who he is, and chances are that I will never know him or see him after this. But at that moment, we are united in silent grief. I walk quietly out the museum. I have seen what I need to see. I don’t have the energy to visit the gardens where I am told that there are also graves. My taxi driver is waiting for me. How was it? He asks. I look the other way. He drives me silently through the streets of Kigali. The newer part of the city. I look at it with fresh eyes. In the same way that the human spirit can sink in depths of destruction and hatred, so can it arise defiantly; to refuse to give up and to begin again. I look at the bricks of the buildings. I try to picture the labourers picking up bags of cement and stone, the brick layers putting one brick upon another. Daily, weekly and into several months. Literally building a nation. Putting the past behind. Forging into the future. It makes me think of my own life. Nothing of this magnitude has ever befallen me and God forbid, never will. Would I be as valiant as these our compatriots? Would I make a conscious decision to put what it behind me to rest and to march forward? Would I have such grit? Would I have such tenacity? We are now headed back to the airport. I drink the sights and sounds of the land of a thousand hills. I will be back Kigali. I tell you, I will be back. I want to get to know more of you.